I'm at a bit of a crossroads here. Retro Review Month has been so successful (really, it has) that I have been considering extending it to the rest of the summer. What do you guys think? Can you ever have too much retro goodness? Regardless, our next review takes us to the shores of Kitchen Island as we traverse Rice Beach, climb up Mt. Teapot, and hop aboard the S.S. Tea Cup for treasure and adventure. (But mostly treasure.) The game is Wario Land: Super Mario Land 3 for Game Boy and the Nintendo 3DS's eShop as a digital download. It's Wario's Land: We All Just Live In It. One of the more favorite characters in the Mario universe is Wario. He wasn't always so loved. A series of handheld titles under the Wario Land moniker helped bolster his reputation among gamers. The games held their own compared to other Nintendo platformers, sure, but they also distanced themselves from the formula Mario and friends built, especially in later Wario Land titles. Wario was not content enough with stealing Mario's castle in Super Mario Land 2: 6 Golden Coins. No, no. He upped and took the entire Super Mario Land series from the heroic plumber! Nevertheless, Wario Land: Super Mario Land 3 remains one of the better Game Boy titles on the platform. Its treasure-hunting, booty-plundering brilliance remains golden to this day. Super Mario Land 3 is a typical 2D platformer. There are seven areas in total of Wario Land's Kitchen Island, one of which is hidden. Most levels are straightforward left-to-right affairs while some are vertical in appearance and design. The design of each level creates a terrific sense of variety, and not just because each area has its own trope. For instance, Parsley Woods is a mainly forested set of levels, but at the same time there are non-trope related train levels to enjoy and endure. Meanwhile, Stove Canyon has a course where the majority of the time Wario is running from a wall of fast-moving fire. Levels are relatively short. The longest ones take about five minutes to go through, but even those have checkpoint totems (turned on by Wario by spending a specific amount of coins) in a room mid-level. The time limits of each course are very generous. Every final level in a given area of Kitchen Island has a boss encounter to round off the platforming fun. These are mostly your standard three-hits-and-they-are-dead battles, but each has a great feeling of originality when compared to one another. Whether you're hurling stone boogers at the face of a foe or knocking a minotaur off the battlefield, you and Wario will have your work cut out for both of you. My only gripe with how bosses and the courses they occur in is that it can be annoying dying at a boss and having to restart the level midway through instead of near the boss's door. At the conclusion of each level, you have the choice of entering one of two mini-games. The first is where you wager your currently held amount of coins and pull one of two strings. One bucket will dump a sack of coins on Wario which will double his earnings; the other will drop a ten ton weight on him, cutting his winnings in half. This game can be played three times before Wario calls it a day. The second mini-game has a foreground Wario chucking five bombs into the background at a moving enemy. Depending on how many bombs hit their intended target, Wario will earn a certain prize, a 1up being the best he can muster. I found this game too difficult to actually win. Bashing baddies and conquering Kitchen Island is only half of the entertainment found in Wario Land. The other half comes from collecting coins and treasure. There are fifteen treasures in the forty courses (the levels of the game) of Kitchen Island. Each is hidden behind a locked skull door that Wario needs to retrieve the key of. Some of these are placed in exceptionally devious locations. I'm alluding to ones where you have to walk through an invisible wall to reach them. Pretty sneaky, sis. After beating the final boss of the game in Syrup Castle, the final area of Kitchen Island, the game tallies up the total of the treasures and tally of coins that you possess. Depending on how much you have acquired (up to 99,999), Wario will receive a different home. From owning a log cabin to having his own face on a moon, Wario's work will most definitely not be for naught. Competent platforming is key in Wario Land. Treasures are not the only secrets to be found in Super Mario Land 3. No, like Super Mario World and Super Mario Land 2, Wario Land has plenty of secret exits. Unlike levels where there are treasure inside them, courses with secret exits are marked clearly on the overworld map. Sherbet Land, the game's seventh and hidden area, can only be visited through discovering a secret exit within one of the levels of Mt. Teapot. Finding a lot of these exits can be quite challenging and require you to play through a level more than once just to uncover them. To discover all there is to Wario Land won't take too long of a time. In fact, I got a perfect game from just over five hours of fun. Even with the game beaten once, I am anxious to return to it once again. Make your opposition see stars. Like a standard Mario game, Wario Land has its fair share of power-ups in the form of hats to, well, power up with. Standard normal-sized Wario can charge into enemies and blocks with a shoulder thrust. By finding some bull horns, Wario can destroy blocks with one charge as opposed to the ordinary two. While in the air, the plump antihero is able to pound the ground, dazing nearby foes as well as crashing through blocks from above. Finally, Bull Wario can use his sharp horns to stick into the ceiling for an unlimited amount of time. While this feat has few uses throughout the length of the game, it is good to have. Meanwhile, Jet Wario can momentarily speed through the sky, flying over large chasms like a superhero. Finally, Dragon Wario grants the greedy treasure hunter the power of breathing fire to close by foes. Any time Wario is hit in a powered-up form, he turns into a miniature Wario, a form that cannot charge at all. If damaged in this state, you, the player, lose a life. This level is a series of slow-moving carts. Wario Land is a capable game graphically. It is without a doubt one of the better looking original Game Boy games as it released in 1994. The sprites of Wario, enemies, and bosses are detailed quite well. They're large enough to see the intricacies of, but they're not too big to take up a majority of the screen, resulting in unfair hits to Wario. The game is slow enough that you don't need to see far ahead of you to know what is coming. Backgrounds have a nice amount of character, especially indoor areas of the game. 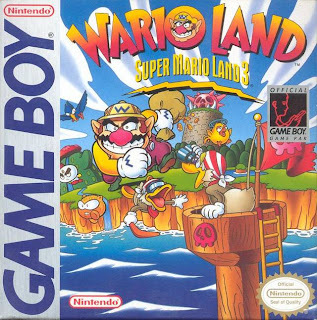 Regarding sound, the music is nowhere near as catchy as past Super Mario Land games, but Wario Land's soundtrack can still catch you humming it whilst you play. Wario Land: Super Mario Land 3 was the start of something splendid. It turned Wario from villain to antihero, and launched a series of games with a cult following. Wario Land may never be as popular or have as many games developed for it than the Mario franchise, but it is yet another 2D platforming franchise from Nintendo that gamers around the world have accepted with open arms. The length of the game might bother some players who are used to 10+ hour adventures, but for the small asking price on the Nintendo eShop, Wario Land: Super Mario Land 3 is one treasure certainly worth taking.